An exciting skills training initiative is underway in the community of New Kru Town on the outskirts of Monrovia, Liberia. 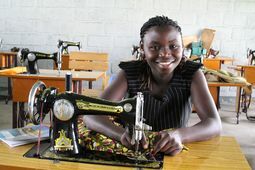 Launched in April 2011, a tailoring school is already bringing hope and positively touching the abilities and self esteem of the students who are residents of this community. The centre occupies half of a 40’ container located out in front of the Grace Chapel Church of the Nazarene. Students from the area come throughout the week to learn sewing techniques over the nine-month apprenticeship. The affordable course fees charged and collected from the students are sufficient to cover the cost of the instructor as well as some of the necessary training materials. In order to efficiently use the space available to them, the school is in need of 10 sewing machine treadle stands ($50 each) to put under their existing sewing machines. With the machine stands as well as some construction materials ($2,300 total), they will be able to create a conducive weatherproof classroom location that incorporates part of the container and a portion of the courtyard of the church. Would you consider partnering and sharing in this ministry of hope? Be sure to put ACM1405 in the Memo area. Thanks for your donation.